Hundreds of Solidarity members today handed a memorandum of protest to Sasol’s management in Sasolburg. The workers are demanding that Sasol amend Khanyisa, its employee share ownership plan that excludes white employees, to be inclusive of all workers. The handing over of the memorandum forms part of a strike by Solidarity at Sasol which began on Monday. Thousands are expected outside the of the Sasol-Secunda plant tomorrow (Thursday). Solidarity plans to bring the plant to a standstill tomorrow. 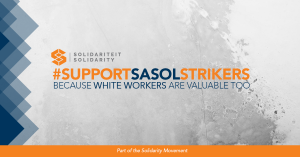 Today, Solidarity members handed 350 memorandums to companies across the country in a show of support for the Sasol workers. “Sasol let the transformation pendulum swing too far. Sasol’s policy has developed into one of unadulturated racial exclusion. The Sasol employees’ actions are making history. They will once again bring a balance to the transformation debate in South Africa,” Solidarity Chief Executive Dr Dirk Hermann said. According to Hermann, they are very satisfied with the strike. “Our members strike strategically. Our goal is to delay Sasol’s maintenance project (shut down) that has been scheduled to run for a three-week period. Every hour we slow down the project costs Sasol millions of rands. Our information is that we have already delayed the overall project by two days. The momentum is building for Thursday when a rally of members and the community will be held outside the main entrance to Sasol Secunda.